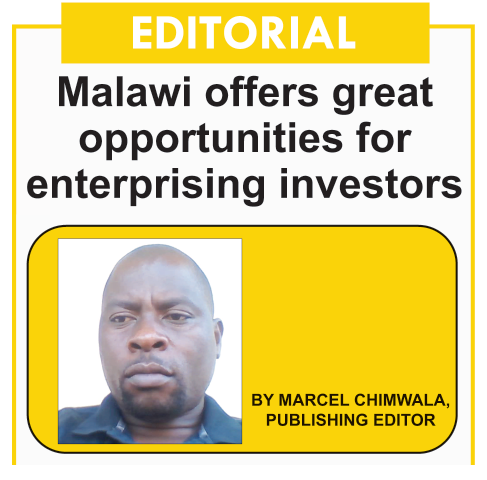 The editorial written by Marcel Chimwala “Malawi offers great opportunities for enterprising investors” featured below was initially published in Malawi’s Mining Review Issue Number 21 2015 that is circulating this January 2015. The full edition can be read here: Mining Review No. 21 January 2015. To learn more about this monthly publication, edited by Marcel Chimwala, read the post about the “Voice of the mineral sector in Malawi”. Malawi has proven to be a decent destination for investors having enjoyed a peaceful atmosphere since independence from the British in 1964. However, it appeared to a cross-section of global mining investors that opportunities in the country are limited since for a decade, people in the country were encouraged to work hard in the field of agriculture as the country was said to have no minerals. Now the situation seems to have changed. A number of surveys by the government and private companies are revealing potential for the mining of a number of minerals with economic potential in the country and it seems Malawi can be in the same boat with its neighbouring countries such as Tanzania, Mozambique and Zambia which are endowed with plenty of mineral resources. The Malawi Government under the leadership of State President Professor Arthur Peter Mutharika is also showing a lot of political will in developing the once neglected minerals sector in Malawi. The Government is among other things reviewing laws that were crafted when the country was a one party autocratic state. The review of the laws, which include the Mines and Minerals Act (1981) and Petroleum Exploration and Production Act (1983), is being undertaken to create an investment climate in the mining sector that will ensure that the investor, the Government and rural communities in mining areas benefit from mining projects. The Malawi Government has also included energy and mining among its priority areas to spur economic development, which is reflected in the Malawi Growth and Development Strategy 2 -a blueprint Government is using to direct development of the country. His Excellency Professor Mutharika has also reiterated in his speeches at various international fora including the US-Africa Summit which he attended last year that his Government will make sure that investors are treated fairly in the country. The political will shown by the government and the interest that the mining sector is getting in Malawi has seen several local retail banks including Standard Bank Malawi, National Bank of Malawi, Nedbank and FDH Bank coming in to support the mining sector. We believe that it is also a chance for investors attending the Mining Indaba in Cape Town and other investors elsewhere to take advantage of the exciting developments taking shape in Malawi to invest in the Warm Heart of Africa.